Recently, Deborah Smith gave another information packed seminar at First Financial to talk about how to build and operate a successful blog for your company. Her seminar was a success, as she covered the whole spectrum of what there is to know about blogging for your business. A “blog” is an internet page where you control the content that gets published through individual articles known as “posts.” Make sure you do your research before creating your own blog. See what you like in regard to color schemes, themes, layout and design. Most importantly, see what other blogs are doing right and what they’re doing wrong, so you don’t make the same mistakes. Purchase a dot com for your blog (if you plan to have a stand-alone blog. One that is not part of an existing website). It lets your readers know that you are established and serious about your blogging. This can be purchased at WordPress.com where you can pay as low as $17 per year. Learn to write! Blogging at its core is a writing intensive process and the better your writing is, the better your blog will be. People want the facts, so be a conscious self-editor and remember that less is more! Try to be consistent in your schedule when publishing blog posts. Pick a set day or several days of the week to post. If you remain consistent with posting, you will see a stonger following. Capture a larger audience by getting people to subscribe to your blog so they receive posts automatically without having to check your site everyday for a new post. Title your blog posts carefully. Although it can be fun to give your post a clever name, it’s important that your title contains keywords so the post appears in search engines. You want to keep your content fresh, so try to mix it up a bit and keep your posts between 500-800 words. Depending on your business, you might want to do some seasonal suggestions, reviews or interviews. “Top 10” lists seem to be very popular in the blogging world, but don’t over do it. 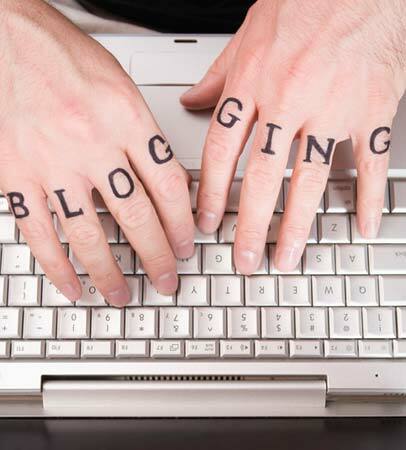 Tagging is a key element to your blogging process. Tags help your blog show up in search engines when users are looking for something particular. Connect with other blogs on the web. There are tons of special interest blogs out there that you can either guest post with or trade links. Link trading is helpful because the amount of links to your site increases your blog’s page rank, and of course the higher the better! Always remember to follow the formula for successful blogging: Great Content + Other People – Marketing Messages = Growth. The formula is from Michael Stelzner’s book “Launch,” which Deborah strongly recommends for those running their own blog. Some common blogging platforms include: WordPress, Blogspot, Joomla,Tumblr, Squarespace, Typepad and Drupal. Deborah has had a very successful food blog for the past couple of years which focuses on great eats in New Jersey. Check out her blog JerseyBites.com for great tips and inspiration! For more social media tips and tricks, subscribe to DeborahLSmith.com. This entry was posted in Business Seminar Summaries and tagged Blogging for Business, Business Seminar Summaries, Deborah Smith, First Financial Federal Credit Union, Monmouth and Ocean Counties by M2 The Agency. Bookmark the permalink.